You have to give Palisades credit for trying new things. While their licensed properties continue to grow - Muppets, Pink Panther, Invader Zim - they're also trying their hand at original stuff. Even though it took them a while, they finally managed to get the Crittaz off the drawing board and onto store shelves. 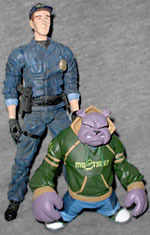 Since I've gone on (at length) before about my collection of anthropomorphic animals, you might be able to guess that I've been waiting for this line ever since it debuted at Toy Fair 2003. Now that they're finally out, were they worth the wait? Dizzle is the muscle of Kingdom City. When you need a job done that requires raw power, he and his group of dogs are the ones you call. Dizzle's only problem is that he's a little slow on the uptake and not the brightest bulb on the sign. Generally good hearted, his dull-wittedness often has him working for the wrong side. The idea of the Crittaz is cool - take the artistic sensibilities of the urban vinyl movement and put it into action figures. Instead of wildly overpriced rotocast statues, however, Palisades has given us surprisingly affordable toys. Though the Crittaz line has a definite urban feel, Dizzle's dressed a bit more "normally" than, say, the rabbit pimp. He's got on a pair of jeans, a green hoodie and chunky shoes. There's a nice little woven texture on his sweatshirt, and the wrinkles of his jeans are captured perfectly. The packaging says that the guys over at Plan-B did the sculpting, and they certainly did a good job. Dizzle's face is very typically bulldogish, with the big jowls and the mighty underbite. His little eyes are painted black with a white pupil, and he's got little black whisker dots above his protruding lower teeth. They even sculpted him a little eyebrow ring. The figure's paint apps are good, with little noticable overspray. 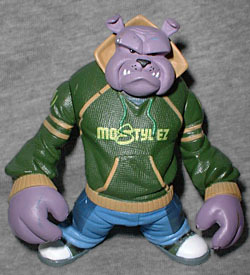 The golden yellow trim on the sweatshirt stays right where it's supposed to, and the "MoStylez" logo on his chest is crisp and clear, though it does seem to go onto the hood's drawstring instead of disappearing behind it. 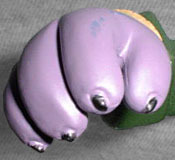 Though the prototype images showed no paint on the eyebrow ring (at that point it looked more like a wart), the production figures have it. There are a few spots of paint transfer - a dark smudge on his hand, for instance - but nothing that's symptomatic of factory problems. The black paint on his nails doesn't quite reach his fingers, but I think that's preferable to having it spill down onto them. Though some of the Crittaz have a few accessories, Dizzle doesn't. He stands 3½" tall and moves at the Springfield Four. Sure, that's kinda sparse, but if that's the sacrifice Palisades had to make so that these figures could be so affordable, it's worth it. Even with the minimal articulation, it's great to see an original property this cool executed this well.